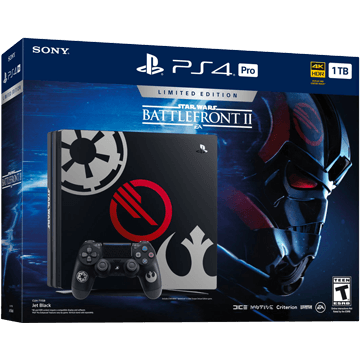 Compare 53 PS4 Pro bundles, with prices from $379.99. 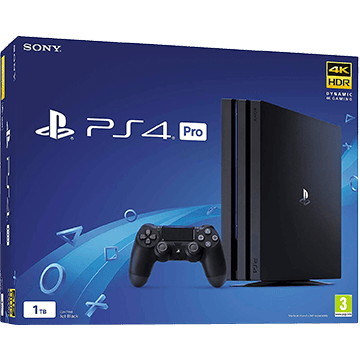 All PS4 Pro’s we list are in stock and available to buy today from 5 retailers, including Walmart, Ebay and Amazon. 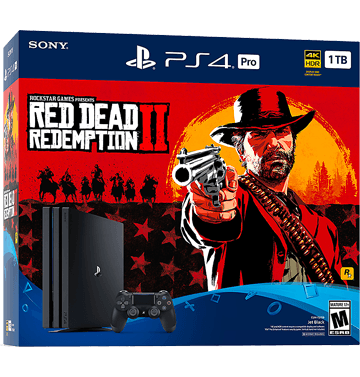 Released three years after the original PS4 console launched on November 10, 2016, the PS4 Pro caters to console players who want to enjoy games at the highest possible graphical fidelity. It greatly improves upon what came before by making use of better processing power, a more sophisticated chassis design, and eliminating the likelihood of slowdown and frame rate drops. 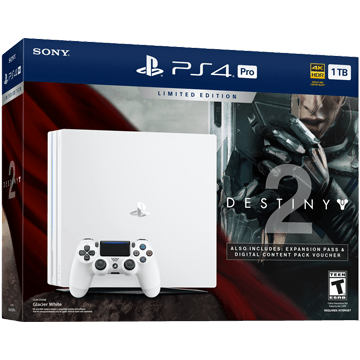 A PS4 Pro boosts the PlayStation experience by quite a bit and is a must for gamers that want to enjoy the newest, latest and best. The PS4 Pro contains double the GPU power present in a standard PS4, offering players a wealth of improved performance benefits – including sharper image clarity, smoother gameplay and load times that are much quicker. A lot of these features require games to be specifically enhanced with PS4 Pro in mind, but they’ve already had a great effect on titles like Marvel’s Spider-Man, FIFA 19 and Red Dead Redemption 2. While it can take a great deal of time for players to learn how to properly gauge the frequency a game refreshes its frames, frame rate is a factor than can harm or hurt an interactive experience quite drastically. First-person shooters, for example, require twitch-level reactions to ensure other players online don’t have an unfair advantage. A PS4 Pro assures that enhanced games have a far easier time running at 60fps, keeping the visuals silky smooth for the most part. PS4 Pro can take full advantage of players with a 4K-ready TV set-up, showcasing the latest blockbuster video games in a resolution almost four times as crisp as standard Full HD or 1080p. It’s not just games that benefit from this feature either, but apps such as Netflix and BBC iPlayer that can stream TV and Film content direct to your PS4 Pro in beautiful 4K. 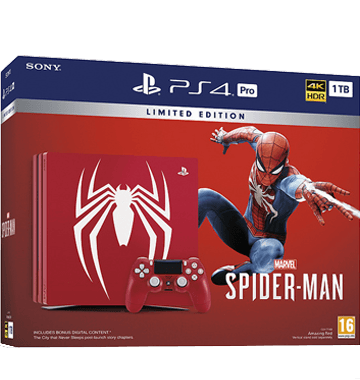 upgrading from original PS4 to PS4 Pro you’ll notice the difference immediately; characters take on a warmer skin tone, materials appear more realistic and environments pull engross you in ways never before possible. HDR or “high dynamic resolution” refers to a type of visual improvement that occurs on the opposite ends of the colour spectrum, making the whites appear whiter and blacks appear darker. This helps colours in games and films have a lifelike appearance. What’s more, HDR is a benefit PS4 Pro brings to players with any type or model of television – not only those that have invested in 4K. While most games in the PS4 library will benefit somewhat from PS4 Pro’s increased power capabilities, certain developers have embedded specific settings and features in their titles that help make the most of the improved performance. Here’s just a taste of the PS4 games that boast incredible 4K clarity, boosted HDR colours and super-fast performance thanks to PS4 Pro. 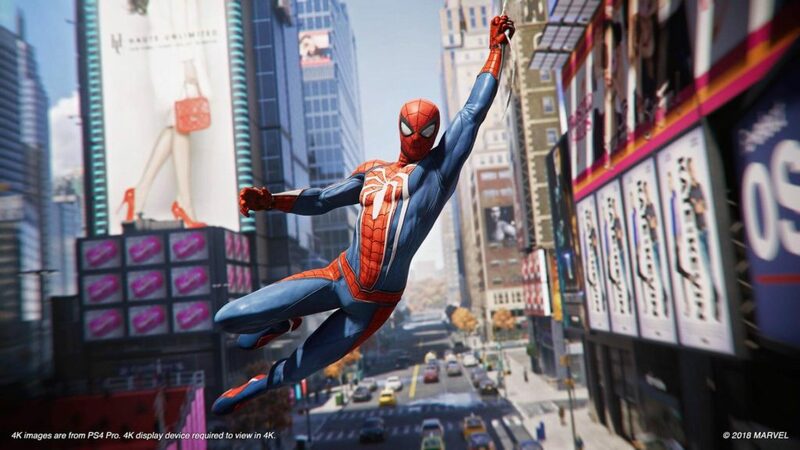 Marvel’s wall-crawler has seen his fair share of video game adaptations over the years, but Insomniac’s vision lets players live the fantasy of being Spider-Man and comes exclusively to PS4. Special attention has been given to the web-slinging mechanics, which makes travelling across an incredibly realistic depiction of Manhattan a breeze as you move from point to point fighting a legion of classic bad guys. Ps4 Pro is also the best way to harness the powers of Marvel’s Spider-Man, never looking better thanks to souped-up 4k visuals and silky-smooth motion. 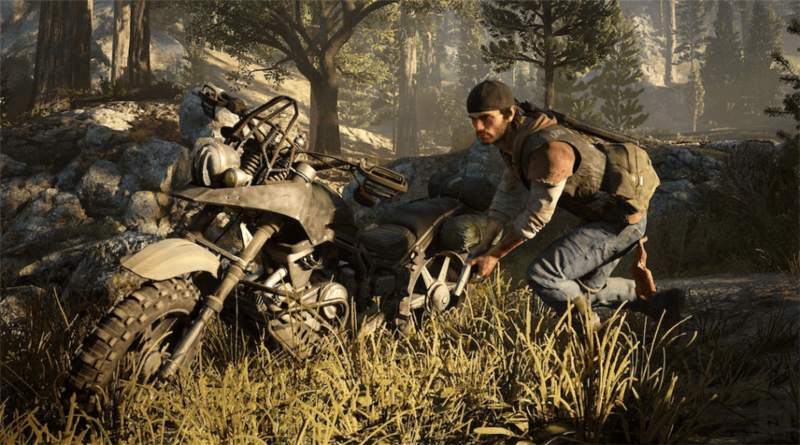 Created from the same developers that gave us Uncharted: Golden Abyss and the Syphon Filter series, Days Gone is an open-world zombie game that tasks you a highly detailed rendition of the post-apocalypse. You take on the role of Deacon St. John a biker-turned-bounty hunter living life on the road and doing whatever it takes to stave off the surrounding undead hordes. Days Gone takes full advantage of PS4 Pro’s potential, featuring extreme weather effects, dynamic lighting and a steady frame rate despite the legions of zombies portrayed in-game. Rockstar’s original Wild West epic inspired the hearts of many gamers when it released in 2010. Fast forward eight years later and it’d be safe to say they did it again with Arthur Morgan’s story in Red Dead Redemption 2. 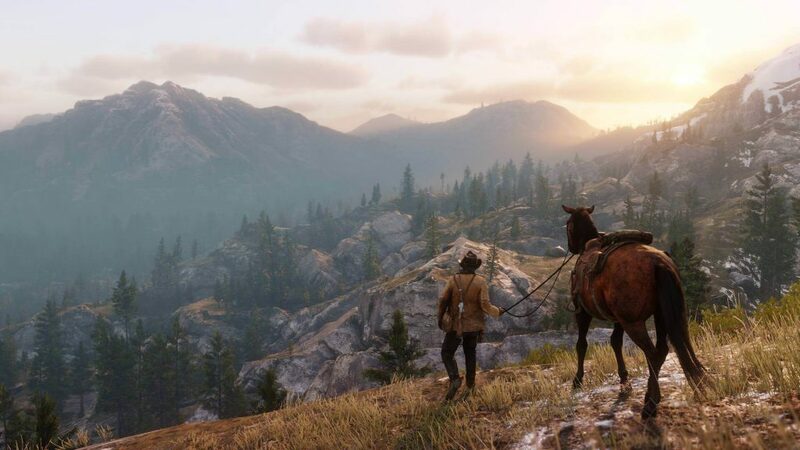 The sequel boasts a Western frontier almost double the size of the original, featuring bustling towns, realistic wildlife physics and a dynamic day/night cycle. All of which add up to an experience that is best played on PS4 Pro. As far as blockbuster entries into Activison’s acclaimed first-person shooter series goes, Black Ops 4 doesn’t disappoint. This is especially true given that it marked the first appearance of what a Call of Duty Battle Royale mode could look like. 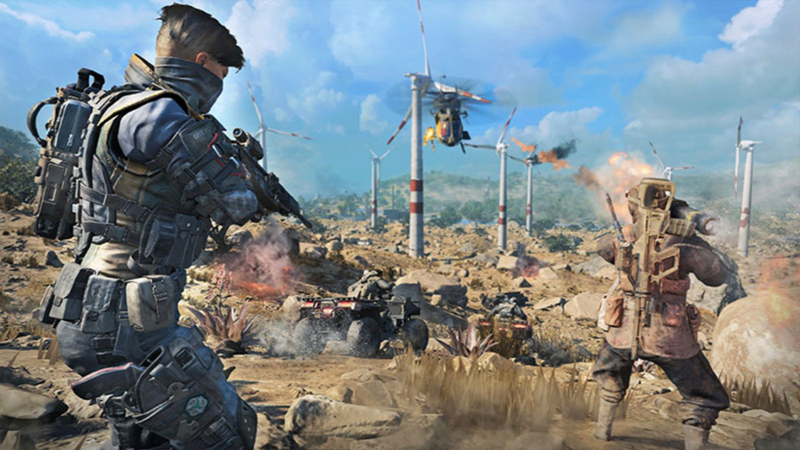 That mode is called Blackout and allows up to 88 players to shoot it out on one giant map in a bid to be the last squad standing. A PS4 Pro helps to immerse you more so while playing Blackout, keeping performance at a steady 60fps and maintaining sharp colours. Everyone’s favourite football sim hasn’t looked or played better than in FIFA 19. 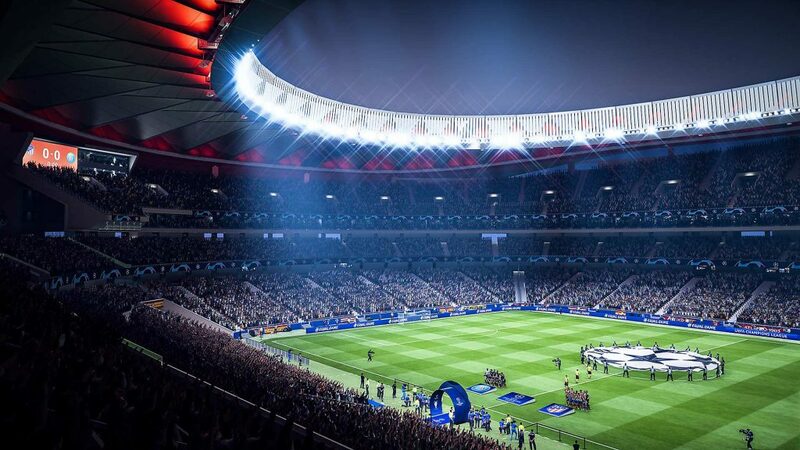 Better yet, the game now includes features tailored specifically for play on PS4 Pro, meaning that keeping up a lightning-fast paced with the ball and scoring the match-winning goal brings you as close to the beautiful game as possible. Frame rates stay at a smooth 60fps on PS4 Pro and stunning HDR visuals makes every match a thrill to take part in. As a mid-generation iteration of Sony’s original PlayStation 4, the PS4 Pro doesn’t differ too drastically to what most players will expect. There are, however, some subtle internal changes that helps the console achieve impressive HDR vibrancy and true 4K resolution. Here we’ll dig into the technical specifics worthy knowing, helping you understand a bit more about what makes the PS4 Pro experience possible. While you’re still likely to find the original launch PS4 and PS4 Slim in bundles boasting just 500GB of internal storage, all PS4 Pros come with at least a 1TB hard drive built in; that’s double the storage of its predecessors. What’s more, the new chassis design makes it easy to get into the Pro for hassle-free cleaning, as well as the potential to buy a larger hard drive and slot it in should 1TB still not be enough for all your digital content. In terms of available ports, there’s nothing too major to worry about if you’re upgrading from a previous model to a new PS4 Pro. You’ll find an extra USB port, which is handy – particularly if you have a PSVR or are thinking about adding one to your set-up. Majorly, though, while prior PS4s had an HDMI 1.4 port, the PS4 Pro has an HDMI 2.0 port to better cater for 4K visuals. This change doesn’t require you to change HDMI cables, however. Your existing leads will work just fine. The internal make-up of the PS4 Pro is where you’ll see the biggest difference from both the original and PS4 Slim. Both consoles run on an AMD Jaguar x86-64, but whereas other models only have a single-chip CPU, the PS4 Pro utilises eight cores. This results in a substantial boost in power, and the same can be said for the GPU which jumps from the 1.84 TFLOP seen in the launch PS4 to 4.2 TFLOP in the Pro. 4K performance is a breeze with all this working in tandem under the hood. Subtle improvements are always happening to all PS4s thanks to regular(ish) firmware updates that are easily downloaded. PS4 firmware 4.50 is worth noting when it comes to PS4 Pro, however, as this is the update that added the so-called ‘boost mode’. This is good news for any game that hasn’t specifically been developed before Pro’s release, giving slightly older games like Far Cry 4, Assassin’s Creed Unity, and any game released before 2017 really, a nice performance increase.